I received an amazing package in the mail today from my friend @addicted2helmet, who sold me this awesome set of 1970s NFL helmet posters. Unlike most posters these are two sided, with the helmet for each specific year on one side and some amazing artwork on the back. I planned on framing these, but the back of them might just be way too pretty for me to hide in a frame. Not sure how I can display them. They fold up like a map and when unfolded are around 11X17. I almost need to get a glass two sided frame for them that I can turn one way or the other depending on my mood. I’m thinking that these posters were a school thing, not unlike the Scholastic posters that featured the NFL helmet. Although the posters themselves don’t offer much information. I scanned all the posters. Check them out in the Slideshow below. The 1975 one had to be pieced together (digitally) because it wouldn’t fit in my scanner. During my previously mentioned trip to the flea market I found some Canadian Football trading cards in the box of unopened packs. The best part is that the cards are mostly in French. I love the CFL and watch most every game when the season starts in June. It is a great league and the football is super fun to watch. I even got a couple Rocket cards! When I was seven, my favorite player was Marcus Allen. I had a Marcus Allen shirt. I loved the Raiders, too young to realize that liking two AFC teams (the Bills) could be an issue. Marcus along with a few Buffalo Bills were my favorites until Bo Jackson came along. what kid who grew up in the late 80s wasn’t a fan of Bo? This card features both backs and makes a fine addition to my Raiders/Bo Jackson wall. This week I watched an amazing piece of footage from the 1946 All-American Football Conference. 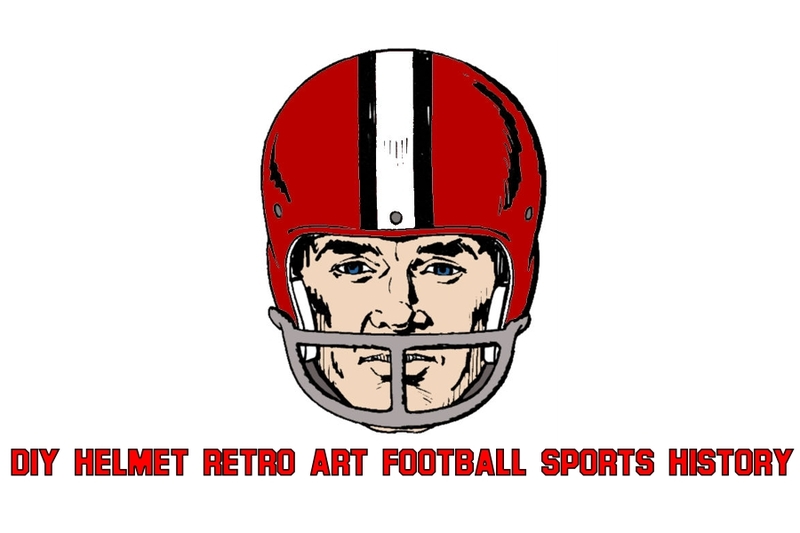 It was a league who competed with the early NFL and featured some cool teams like the Bisons, Chicago Rockets, Miami Seahawks and the New York Yankees. The league also featured the Cleveland Browns, Baltimore Colts (not related to the current franchise) and 49ers. The Bisons were one of the more successful clubs in the league, both on the field and in the stands. The next season in 1947 they would hold a contest for a new name and the winner chose the Buffalo Bills after Buffalo Bill Cody of Wild West Fame. Interestingly enough there was a popular barbershop quartet of the same name that got their start in 1947 as well. The Bills would not be long for the world though as the AAFC was not making money and eventually in 1949 merged with the NFL, with most of the AAFC teams folding with the exception of the Browns, and 49ers, who were both very successful and the controversial choice of the Baltimore Colts. The Bills were more successful in all aspects than Baltimore, but in the end league owners decided that Buffalo was too small, the weather was not ideal and it is also said that Bears Owner George Halas had some lingering animosity towards Buffalo based on their previous football franchise and the Bills were not admitted to the NFL. Most of their player would go to the Packers after the team folded. Back before Christmas my brother bought some Notre Dame decals (bumpers) so I could make him a Notre Dame helmet for someone he knew. It ended up that person already had one, so I got to keep the bumpers. I decided to make a 1990s style Notre Dame helmet, similar to what Rocket Ismail wore during his time with the Irish. The gold back then was sprayed painted on by a group of student equipment managers, but eventually that was fazed out and with the new dome gold helmets, there was no need as they are factory painted. Both are said to contain gold leaf from the dome itself. The new helmets are way more gold than the old ones and have a texture to them. In general I think I prefer the old gold. For my helmet I had to find a gold that matched or at least was fairly close. I was able to find a gold paint that matched pretty well. I then added a gray facemask and added the front “Irish” nose bumper. All and all a successful project.